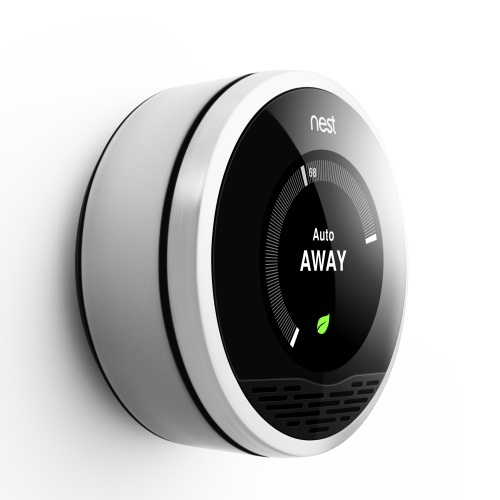 The Nest has a number of sensors and some smart software that allows it to learn and create a schedule based on how and when you adjust the temperature. It can automatically sense when you’re away and make adjustments accordingly and guide you to make small changes that can save you lots of money. It’s also connected via Wi-Fi, so you can control it remotely with a phone or computer and have it automatically receive software updates to improve itself. > Fadell got the idea for Nest Labs when he was building a green home in Tahoe. A long-time aficionado of architecture, he threw himself into the details of house design. His domicile would be as gorgeous as the products he worked on at Apple, endowed with the same love of detail. When it came to HVAC — the industry acronym for heating, ventilation, and air conditioning — he worked with architects to drill sophisticated geothermal wells to regulate temperature. Everything was looking great. And then the architects presented him with the options for the thermostats that would adorn the walls of his perfect home. This sort of thing is really excites me, so while I’d love to pre-order one right now, the $250 price tag makes me hesitate. Hopefully they’ll be able to bring costs down the first year and make it a little less expensive, because this looks like a great product that could make a big difference to the environment.